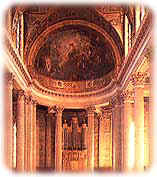 Ile de France, hotels in Ile de France, holidays in Ile de France, with Drive-Alive. Self-drive Holidays in the Ile de France for the Independent Motorist. Ile de France for a breath of fresh air and an escape from the city of Paris. Explore this area of famous chateaux, extraordinary churches, museums, parks, gardens and woods. Chantilly. Chateau, horses and extensive grounds. 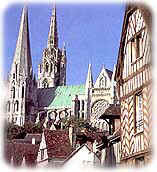 Chartres. Perhaps the finest cathedral in the world. Disneyland Paris. There are rides and activities for children of all ages with a surprisingly genuine happy atmosphere. If you have children it is definitely worth a visit. Fontainebleau. The enormous chateau is worth visiting as much for the surrounding forest as for itself. Le Bourget. Museum of Space and Aviation with loads of exhibits from the early days of aviation to the space age. Palais de Versailles. The Palace is full of treasures, in the extensive park you can cycle, and boat on the Grand Canal. St. Denis. Gothic cathedral and surrounding market. Germain, with some good walks, stretching behind. Sceaux. Museum of the Ile-de-France set in the chateau which in turn occupies an attractive park.